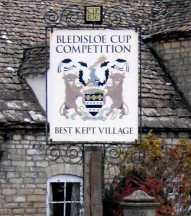 It was in 1937 that the 'Best Kept Village' competition was started for places in the English County of Gloucestershire and was founded with the official title of “Bledisloe Cup Competition”. 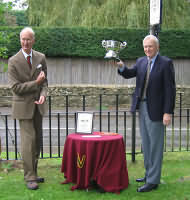 Most English counties now have a “best kept village” competition all originating from the Gloucestershire competition of 1937. The awards are given to different categories of villages i.e. small villages of populations up to 300, medium sized villages with populations from 300 to 1000 and large villages with populations of 1000 to 3000. It is not intended that the award is given to the prettiest village, but to the people of the villages who make the greatest effort to cope with the surroundings in which they live and allowances are made by the judges for those who face special difficulties. It is however essential that the village is kept neat and tidy, points are awarded or deducted accordingly. This is a prestigious event and winners are justly proud of their achievements. Winners in past years have been - Small Village - Lower Slaughter; Medium Village - Willersey; Large Village - Bourton-on-the-Water. 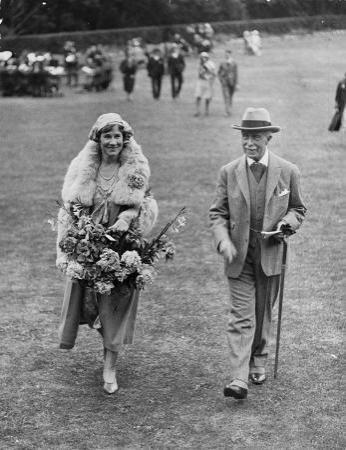 The Right Honourable Sir Charles Bathurst was Governor General of New Zealand from 1930 to 1935 and it was in 1935 that he was created Viscount Bledisloe of Lydney. A lawyer for sixteen years until he inherited his Fathers estate at Cirencester, he held a number of ministerial and public offices within the United Kingdom before his years in New Zealand. The Earls Bathurst have lived at their family seat at Cirencester Park, Cirencester, Gloucestershire since 1690. The park is well known to the polo playing fraternity as Ruins Polo Ground, a place where Charles the Prince of Wales has played on many occasions. Viscount Bledisloe also donated the Bledisloe Cup for the New Zealand – Australia rugby. The name 'Bledisloe' was taken from an ancient name appertaining to the area of the Lydney estate. Charles Bathurst decided that he did not wish to offend the population of any particular area so he used the anglo-saxon name given to the area. The house is a home of Lord Bledisloe, its origins are of Victorian times and is now partly used as a museum containing local artefacts and a collection of items from New Zealand. The park however goes back to the 17th century and is located within the Royal Forest of Dean and known for its gardens and Roman Temple complex. 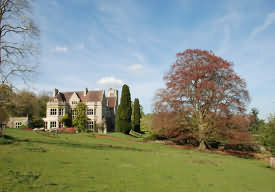 Lydney Park extends over some eight acres and dates from the 20th century consisting of a woodland garden running through a secluded valley. In the spring a blaze of colour confronts the visitor because the valley is planted with magnolias, rhododendrons and azaleas which dwarf the onlooker; many other flowering shrubs add to its beauty. A plus to this is the formal gardens and a display of daffodils. Lydney Park Roman Temple was built in the 4th century to Nodens, this followed an earlier Iron Age settlement in the area. Nodens was a Celtic divinity and is mentioned in Irish and Welsh mythology. Many of the artefacts found on this site indicate that Noden had a connection with the sea. A bronze headdress was found which depicted a Sea-god driving a chariot. Numerous finds have proved that the occupation extended into the 5th century, more than 8000 coins, a bronze plaque, 300 bracelets plus in excess of 320 pins indicate that it was a wealthy community. It was in 1929 that the prominent archaeologist Sir Mortimer Wheeler examined the site and excavated it with help from the author JRR Tolkien. Sir Mortimer gained a great deal of TV fame in the 1950s appearing in many programmes of Animal, Vegetable and Mineral, his wealth of knowledge, relaxed charm and wit attracted many viewers. JRR Tolkien is well known for his writings about the Hobbits and it is believed that he had much of his inspiration in writing Hobbiton and the Shire through his work at the temple site. The area was riddled with tunnels and open cast mines that the landscape was considered to be both mysterious and mystic, so much so that, it was believed that it was occupied by Hobgoblins. Born in South Africa in 1892, he had a brother who was a fruit farmer in the Vale of Evesham and his visits to the area with the views of Bredon Hill also influenced his writing. Visitors can visit the converted coach house and farm buildings now occupied as a gift shop. Open late March to early June and bank holidays, there is an admission charge of £3. With its large picnic area and refreshment facilities Lydney Park provides the ideal place for a relaxing day out. Rugby Union's Bledisloe Cup is contested between Australia's Wallabies and New Zealand's All Blacks. It is named after Lord Bledisloe, the Governor-General of New Zealand who donated the trophy in 1931. If the All Blacks and Wallabies play each other in a non-Tri Nations game (e.g. they are drawn to play each other at a World Cup), the Bledisloe Cup is not on offer. 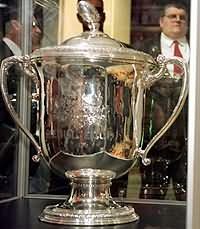 The trophy was designed in New Zealand by Nelson Issac, and crafted by Walker and Hall in London. In size remains the biggest trophy in world rugby. There is some dispute as to when the first Bledisloe Cup match was first played. The Australian Rugby Union contend that the one-off 1931 match played at Eden Park was first. However, no firm evidence has been produced to support this claim, and minutes from a New Zealand Union management meeting several days later record Lord Bledisloe wishing to present a cup for the All Blacks and Wallabies to play for. The New Zealand Rugby Football Union believe that the first match was when New Zealand toured Australia in 1932. Between 1931 and 1981 it was contested irregularly in the course of rugby tours between the two countries. New Zealand won it 19 times and Australia four times in this period. In the years 1982 to 1995 it was contested annually, sometimes as a series of three matches and other times in a single match. During these years New Zealand won it 11 times and Australia three times. Since 1996 the cup has been contested as part of the annual Tri Nations tournament. Until 1998 the cup was contested in a three match series: the two Tri Nations matches between these sides and a third match. New Zealand won these series in 1996 and 1997, and Australia won it in 1998. From 1999 through 2005, the third match was not played; during those years, Australia and New Zealand played each other twice as part of the Tri Nations for the cup. If both teams won one of these games, or if both games were drawn, the cup was retained by its current holder. The non-holder had to win the two games 2-0 or 1-0 (with a draw) to regain the Cup. A criticism of this system was that with the closeness in the level of ability between the two sides, years where each team won one game each were very common (1999, 2000, 2002, 2004) and in these years, many rugby fans felt dissatisfied with one team keeping the cup in a series tied at 1-1. In 2000, the Bledisloe was retained by Australia when John Eales kicked a goal from the sideline in the final moments of the match. Another one of the most dramatic matches was played on September 1 of 2001 at Stadium Australia, in what would be Wallaby great John Eales' last ever test. Australians were hoping to send their skipper off in a grand style. A fairy tale ending was looking right in the first half when the Wallabies held a solid 19 to six lead over the All Blacks. However, tries to Doug Howlett and Pita Alatini, along with Andrew Mehrtens kicking, saw the All Blacks back in front 26 to 22. However in the dying moments of the game no.8 Toutai Kefu scored the winning try for Australia. From 2006 onwards, the Bledisloe Cup will again be played for over a 3 match series, as the Tri Nations has been lengthened so that each participating nation plays the others three times instead of twice. This will ensure that in most seasons, a clear winner of the Bledisloe Cup will be found. The last Bledisloe Cup match was held on June 30, 2007 at the Melbourne Cricket Ground (MCG). Longest Time Held By Australia: 5 years (1998-2002) Longest Time Held By New Zealand: 28 years (1951-1978). He was born in 1890 in Glasgow, at the age of 4years he moved to Bradford where he attended the Bradford Grammar school from 1897 -1905. From 1906 -1912 he studied at the University College of London and obtained degrees Bachelor of Art and Master of Art. The first world war 1914-1918 interupted his career and following the ceaseation of hostilities he took up an appointment in 1919 as Keeper of Archaeology in National Museum of Wales. He left this position in 1926 to take up duties as Keeper of Archaeology in the Museum of London. Following this, in 1937 he became Director at the Institute of Archaeology University College London. In 1944 -1948 he became Director General of the Archaeological survey of India. In 1950 -1968 he was Secretary of the British Academy.